Nothing will beat the first time I walked into the large glass doors and enormous hallways of the Detroit Renaissance Center. It was like I stepped into a storybook, a whole new world. Seas of people dressed in intricate armor with weapons in tow and wigs with colorful outfits brought me into an unknown but intriguing space. Stumbling to find registration with my friend, I felt excited as I tried to process the world around me. I was dressed in my Spirit of Halloween Princess Peach costume, and I attempted to flip my short, blonde hair to somewhat look like her. In 2012, I heard about this event called Youmacon in Downtown Detroit through a print newspaper ad, and I was so excited, I picked up a costume and had to check it out. I originally only planned on attending Friday night, but that soon changed. After spending a few hours dancing on the newly released Dance Dance Revolution cab, walking from room to room, and seeing all the amazing cosplays and fellow nerds,I had to go back. My friend and I returned Sunday, and I eagerly attended my first panel (for Legend of Korra), had my first experience with the dealer’s room, and returned home with a desire to attend again. Little did I know, this small decision to attend would change my life. I always was into anime and video games, but the world of cosplay was new to me. Something about it just clicked. I spent a few months after Youmacon researching cons and had plans to cosplay from one of my favorite anime at the time, Soul Eater. At my second Youmacon, I cosplayed one of the main characters from Soul Eater (Maka Albarn) with my own hair and a similar dress I found at the thrift store. That’s when it started. People asked for my picture and I was so happy. I attended my first group photoshoot on the steps of the Detroit Riverwalk, and it was an amazing experience. I don’t recall ever doing anything as fun as attending a con, meeting new people, and finally feeling somewhat comfortable in my own skin. I just felt special. Since I knew more about cons, I finally had the full experience, attending as many events as possible. I randomly picked up Persona 3 in 2014, not expecting what would happen next. Although I always have loved games, I never played a game that got me hooked so quickly. There was something so intriguing about being able to play a game with social sim elements and JRPG battles. However, there was one special aspect about the series- the concept of the “persona” in another world. The high-level theme of the games is the symbolism of one’s other self, manifested into another being in a parallel world. They fight with this entity by their side, pushing forward and developing their own character along the way. Characters deal with real life issues such as bullying, sexism, and wanting to be worth something in their world. Through social links, you learn about others and help them with their problems. Over time, you also develop your other self. Cosplay is my other self. When I cosplay, I still am me. However, I am also representing a character who I love and am passionate about. It allows me to channel that persona and give me the power to be who I want to be. Cosplaying Persona changed my entire perspective of the community and myself. Since I was in 3rd grade, I had a lifelong battle with an eating disorder and low self esteem. At one point, I would throw out my lunches to lose weight and would cry every time I looked in the mirror, as it was my worst enemy. As a tennis player in high school, I lost almost all of my muscles and strength. Although I recovered by the time I got into cosplay, I noticed an entirely new change in myself. My mind was telling me otherwise. I was telling myself I shouldn’t wear something that tight or revealing. I was worried. Anxious. Scared of the lies I’d tell myself. Would my body look okay in this? I took that chance. Taking a red catsuit and a bunch of glue and zippers, I put together my Panther cosplay and the opposite that was expected happened. I felt confident and empowered. I felt myself smiling and loving myself for who I was and representing the series I am so passionate about. This sparked everything. The more I learned about the Ann, the more she became special to me. Learning about her character dealing with unwanted advances and standing up for herself inspired me to do the same. I went through similar situations before, but seeing her be such a strong female character empowered me to do the same. Over time, and several cosplays later, I learned to accept myself. Starting up my cosplay social media, I was shocked and grateful of the support I was given. It made me so happy to interact with the community, and over time it changed my self perception. I loved posting and meeting new friends at cons. It gave me life and made me look forward to every con weekend. As someone who was very introverted, I soon began to break out of my shell. I was outgoing, excited to see friends and those I’ve met online. It empowered me to run shoots of up to 200 people, as well as speak and present panels about my passions. My entire mindset was shifted. I could say that 5 years ago, I would never even attempt to wear a bikini. Now, I have no problem, and even feel confident in one. I know my body isn’t “perfect” or will never be, but the support and love of the cosplay community helped me accept ME. That’s when I realized my mission. If anyone who is feeling bad about themselves or feel that they can’t be who they want to be, I will encourage them because I truly believe anyone should love their hobbies. I will not stand hate towards cosplayers, and I will fight against it. It doesn’t matter what size, race, gender, or any difference one may have. They should be able to cosplay, or do whatever they love without having someone make them feel they can’t. The cosplay community isn’t all rainbows and sunshine, but there is hope. There are some of the best people you’ll ever meet out there. Cosplay is powerful. It is how I met my boyfriend, dear friends, and a community I am proud to be part of. Cosplay isn’t just some dress up game and is more than just an activity to keep me busy on the weekends. It can be life changing and it can help you in day to day life. Since cosplaying, I have developed public speaking skills (via panels), found a love for pursuing a social media marketing career, learned to accept myself, and most recently, hosting my own convention to create a special environment that supports the love I see. I’ll always cherish the moments I have when meeting someone who said I helped them get into cosplay or helped them feel better about their body and themselves. I want to be that support. I want to help others through cosplay, much like it has helped me. ED NOTE: Emily Auten (EmCat Cosplay) is a passionate cosplayer and currently works as a copywriter intern. 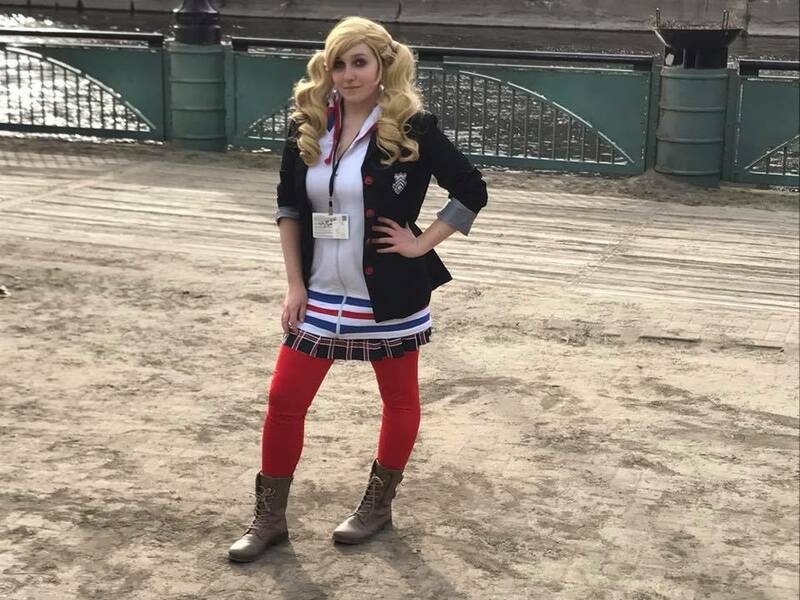 Having blogged on various gaming blogs, we wanted to give her a chance to let her love of cosplay shine in this op ed. Make sure to like her on Facebook to follow her cosplay exploits.